The tomb of Queen Meresankh III – located at Giza close to the world-famous Pyramids and Sphinx – is set to open later this year. The tomb, discovered in 1927 by the American archaeologist George Reisner, boasts vivid wall paintings and inscriptions. Five further tombs of both Pharaohs and ancient high priests are also set to reopen to the public in the near future. “…I came upon a large party of twenty or thirty indomitable Americans dragging their feet, under the leadership of a dragoman, across the sand from a charabanc. I fell in behind this party and followed them underground…. into a vast subterranean tunnel called the Serapeum, which, the guide explained, was the burial place of the sacred bulls. It was like a completely unilluminated tube-railway station. We were each given a candle, and our guide marched on in front with a magnesium flare. Even so, the remote corners were left in impenetrable darkness. On either side of our path were ranged the vast granite sarcophagi; we marched very solemnly the full length of the tunnel, our guide counting the coffins aloud for us; there were twenty-four of them, each so massive that the excavating engineers could devise no means of removing them. Most of the Americans counted aloud with him. One is supposed, I know, to think of the past on these occasions; to conjure up the ruined streets of Memphis and to see in one’s mind’s eye the sacred procession as it wound up the avenue of sphinxes, mourning the dead bull; perhaps even to give licence to one’s fancy and invent some personal romance about the lives of these garlanded hymn-singers, and to generalize sagely about the mutability of human achievement. But I think we can leave all that to Hollywood. For my own part I found the present spectacle infinitely stimulating. What a funny lot we looked, trooping along that obscure gallery! First the Arab with his blazing white ribbon of magnesium, and behind him, clutching their candles, like penitents in procession, this whole rag-tag and bobtail of self-improvement and uplift. Some had been bitten by mosquitoes and bore swollen, asymmetrical faces; many were footsore, and limped and stumbled as they went; one felt faint and was sniffing ‘salts’; one coughed with dust; another had her eyes inflamed by the sun; another wore his arm in a sling, injured in heaven knows what endeavour; every one of the party in some way or another was bruised and upbraided by the thundering surf of education. And still they plunged on. One, two, three, four… twenty-four dead bulls; not twenty-three or twenty-five. How could they remember twenty-four? 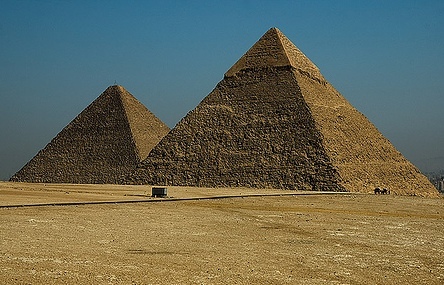 Why, to be sure, it was the number of Aunt Mabel’s bedroom at Luxor. ‘How did the bulls die?’ one of them asks. ‘What did he ask?’ chatter the others. ‘What did the guide answer?’ they want to know. Oh, ladies and gentlemen, I longed to declaim, dear ladies and gentlemen, fancy crossing the Atlantic Ocean, fancy coming all this way in the heat, fancy enduring all these extremities of discomfort and exertion; fancy spending all this money, to see a hole in the sand where, three thousand years ago, a foreign race whose motives must forever remain inexplicable interred the carcasses of twenty-four bulls. Surely the last laugh, dear ladies and gentlemen, is on us.